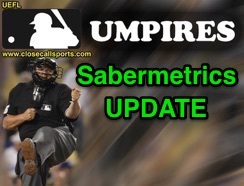 UEFL's MLB Umpire Sabermetrics report for July 2017 is now available, featuring 118 ejections and 889 Replay Reviews through 1,574 games played. >> 118 Total Regular Season Ejections through July 31, 2017 (on pace for 182 ejections this season). >> Umpires Bill Welke, Sam Holbrook, and Phil Cuzzi led all umpires in ejections. >> Most ejections occurred in the 8th inning; Ejections from 7th and on comprised 45% of all tosses. >> Most ejections occurred on Saturdays. Weekend series (Fri-Sun) featured 50% of all heave-ho's. >> The most common reason for ejection was Balls/Strikes, followed by Check Swing. >> All else equal, a team tied at the time of ejection ended up winning the game 95.2% of the time. >> 889 Total Replay Reviews, of which calls were affirmed 51.2% of the time (48.8% overturned). >> The Kansas City Royals were the League's most successful team in review (17-for-23). >> The BAL Orioles experienced fewer reviews than any other team, and were 2nd best in MLB. >> Umpire Doug Eddings had a league-leading 20 calls reviewed, and was above average in outcome. >> Jeff Nelson's crew led all of baseball in replay activity, and performed at league average. >> Umpire Chad Fairchild led in accuracy with all of his calls affirmed by replay (5/5). >> Umpire Gerry Davis experienced the highest rate of his calls being overturned by replay (0/5). >> The 7th inning had more reviews than any other inning. 33% of all reviews occurred from 7th-on. >> Most reviews occurred on Sundays; Weekend series (Fri-Sun) featured 52% of all replays. 1. Chad Fairchild, Pat Hoberg, Sean Barber, Dale Scott - 100% RAP. 5. Vic Carapazza - 81.8% RAP. 6. Alfonso Marquez - 78.6% RAP. 7. Bill Miller - 77.8% RAP. 8. Adam Hamari, Quinn Wolcott - 75.0% RAP. 10. Chris Guccione - 72.7% RAP. 85. Ron Kulpa, Dana DeMuth - 20.0% RAP. 87. Lance Barrett, Kerwin Danley, Brian O'Nora - 14.3% RAP. 90. Gerry Davis, John Libka - 0.0% RAP. Total Games Played Through May 31, 2017: 1,574 of 2430 (64.8% of the season has been played). Ejections: 118. (Compare to 120 through June 2016). Pace is 182 ejections / 2430 games played. "Team most active" (Team with most Ejections): CWS 12; TOR 7; BOS, LAD, MIA, TB, TEX 6. "Team least active" (Team with least Ejections): CLE 0; BAL, LAA, PHI 1. "Manager ejections leader" (Most Ejections): Rick Renteria 6; Gibbons, Banister, Mattingly 4. "Player ejections leader": Bryce Harper, Miguel Sano 2. "Umpire leader" (Most Ejections): Bill Welke, Sam Holbrook, Phil Cuzzi 6; Will Little 5. "Crew most active" (Crew with most Ejections): Holbrook 15; Hallion 11; Everitt 9; Emmel, West 8. "Most accurate umpire" (Umpire with greatest QOC): Culbreth, Emmel (3 Y / 0 N + 1 U = 1.000 QOCY). "Overall QOC percentage" (Overall QOC Y value): .630 (63 Y / 37 N) + 18 Irrecusable = 118 Total. "Team Status Pre-Ejection" (Winning-Losing-Tied [W-L-T] Record prior to Ejection): 22-75-21. "Team Status Post-Ejection" (Game Record [W-L]): 42-76. (Delta: 20-1; WPCT: .952). By Inning: 8 (19); 5 (18); 7, 9 (17); 6 (16); 1 (10); 2, 4 (7); 3 (6); Extras (1). By Reason: Balls/Strikes (65); Check Swing (8); Throwing At, Replay Review (7); Balk, Fighting (6). By Day of Week: Sat (23); Sun (19); Wed, Thurs, Fri (17); Mon (14); Tues (11). Replay Reviews & Decisions Rendered: 889, .512 RAP (455/889). On pace for 1372 replays. "Team Most Used" (Used Replay Review most often): TB, TEX 47; ATL 40; PIT 39; CHC 38; TOR 37. "Team Least Used" (Least use of Replay): BAL 19; MIA 20; PHI, WAS 21; CWS, KC 23; SF, NYY 24. "Most successful team in review" (Team with highest TSP): Royals - .739 (17/23). "Least successful team in review" (Team with lowest TSP): Blue Jays - .297 (11/37). "Umpire most questioned" (Most Replay Reviews): Doug Eddings 20; Fagan 18; (3 Tied) 16. "Crew most questioned" (Most Reviewed Crew): Jeff Nelson 55; Winters 52; T Barrett 49. "Most accurate umpire" (Umpire with greatest RAP): Chad Fairchild - 1.000 (5 Y in 5 Total). "Ump of greatest overturn" (Umpire with lowest RAP): Gerry Davis - .000 (0 Y in 5 Total). - By Reason: Out/Safe [Force - 1st] 227; Out/Safe [Tag - Into Base] 154; Out/Safe [Tag - Stolen Base] 93; Out/Safe [Pulled Foot] 67; Out/Safe [Tag - Pickoff] 44; HR/In Play 40; HBP/No HBP 38. - By Day of Week: Sun (178); Sat (147); Fri (135); Tues (123); Wed (109); Thurs (101); Mon (96).